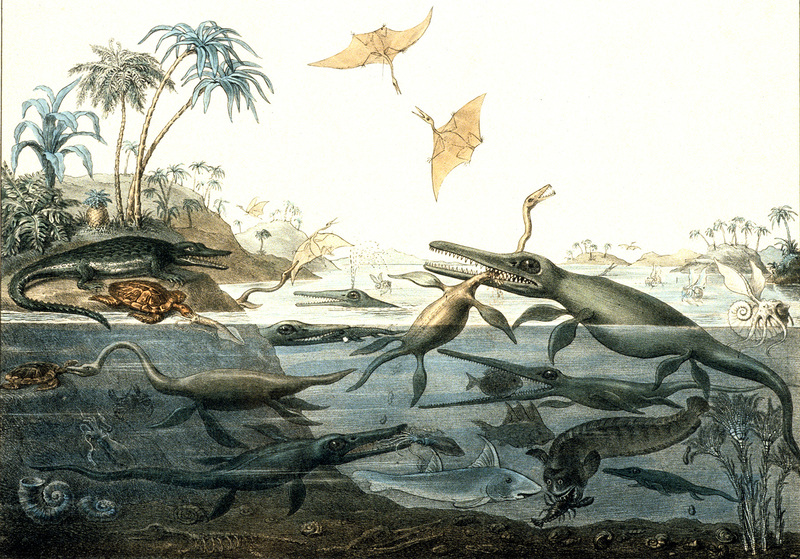 This 195-million-year-old marine reptile was discovered at some time before 1836 by the British palaeontologist Mary Anning (1799–1847). It is an ichthyosaur from the Jurassic period, and the fossil contains the visible remains of prehistoric fish in its stomach. Partial skeleton of a young ichthyosaur with stomach contents from the Lower Jurassic of Lyme Regis. Collected by Mary Anning at some time before 1836. Pastel portrait of Mary Anning by Benjamin John Merifield Donne, 1850. ©The Geological Society of London. Duria Antiquior - A more Ancient Dorset painted by Henry De la Beche in 1830, is the first artistic representation of a scene of prehistoric life based on evidence from fossil remains, today known as ‘palaeoart’. 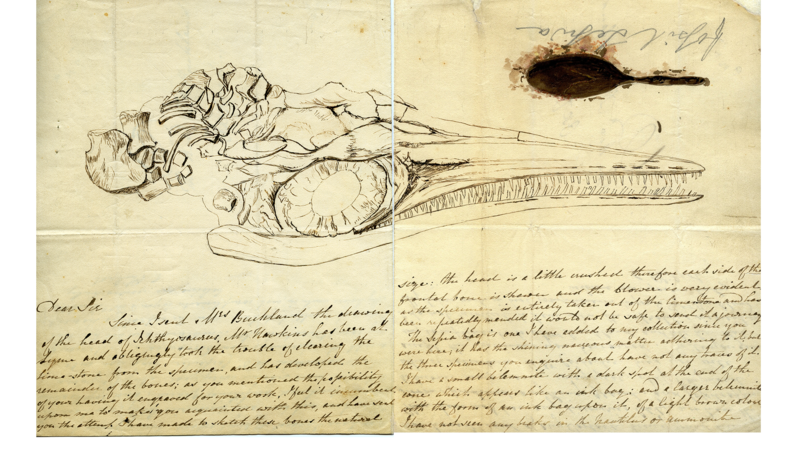 A letter from Elizabeth Philpot to William Buckland, c. 1833, containing a sketch of the same ichthyosaur skull after preparation, and a fossil ink sac painted in fossil squid ink. The ichthyosaur fossil is so well preserved that fish bones and scales from its last meal can still be seen inside its ribcage. It is one of the first ichthyosaurs ever discovered with preserved stomach contents from the UK. 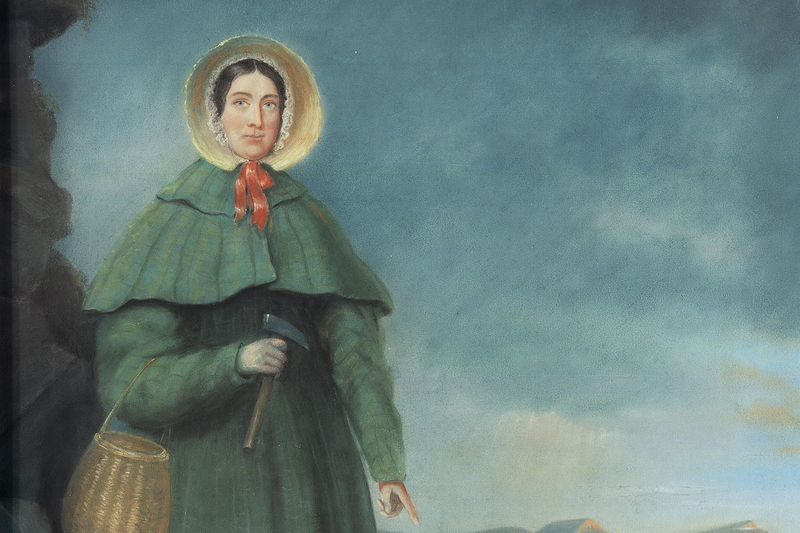 Its discoverer, Mary Anning, lived and worked in the English coastal town of Lyme Regis, finding and selling fossils. She made many important discoveries in the Jurassic rocks there, including the first plesiosaur to be scientifically described, and many other ichthyosaur skeletons. Her life, scientific work and discoveries are now celebrated worldwide. 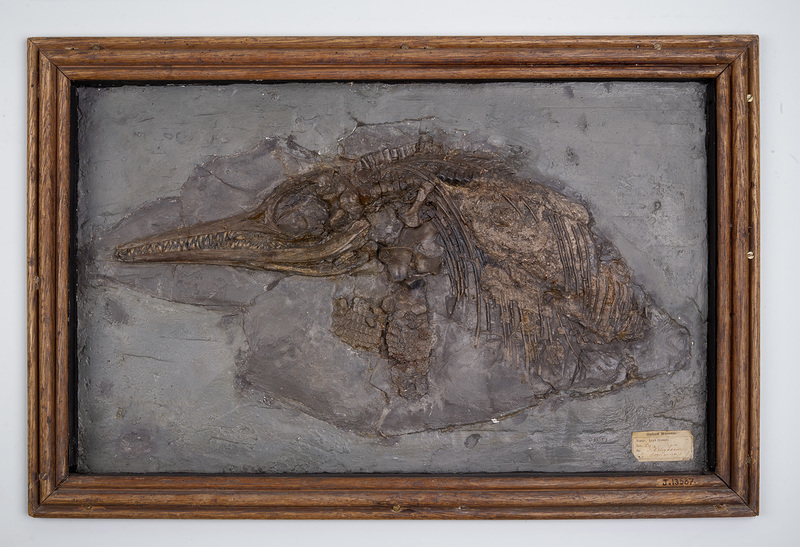 This particular specimen has recently been reidentified as a juvenile of Ichthyosaurus anningae, named after Mary Anning. 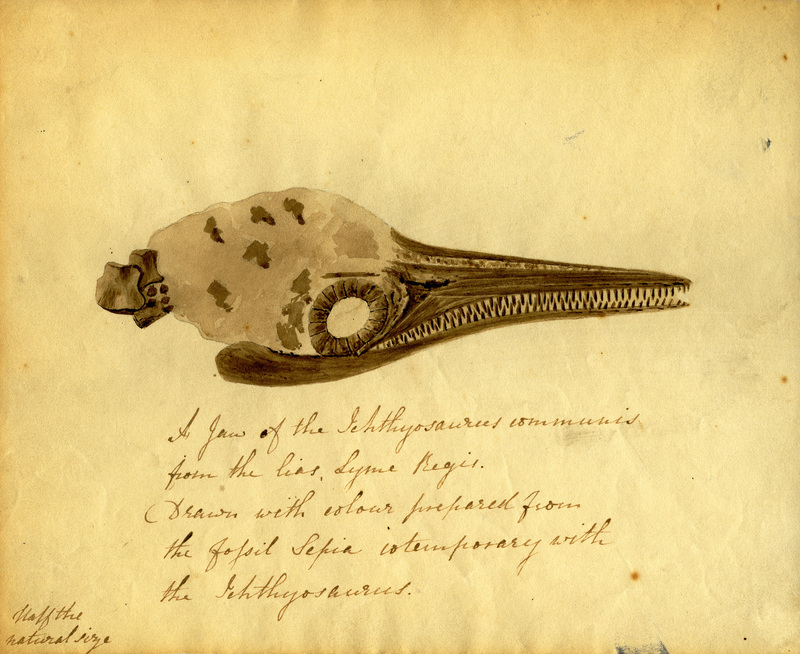 An illustration of Mary Anning’s ichthyosaur skeleton appeared in William Buckland’s book Geology and Mineralogy (1836). Drag the divider to reveal the accuracy of this detailed drawing, alongside the original fossil. Discover more about Britain’s most famous location for fossil hunters, Dorset’s Lyme Regis.